The rumors of Jon Gruden returning to the NFL as head coach of the Oakland Raiders have not been exaggerated. 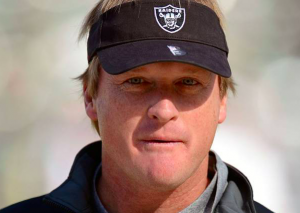 Reports surfacing Friday indicate that Gruden is set to sign a 10-year deal to become head coach of the Raiders. The deal could be worth as much as $100 million. The Raiders have called a press conference for Tuesday when they are expected to officially introduce Gruden as their new head coach. NFL teams are not required to disclose their financial agreements with coaches. However, it’s believed that Gruden’s deal will be the largest for a head coach in league history. Gruden is currently making $6.5 million per year to serve as the color analyst for Monday Night Football on ESPN. He had previously signed an extension with ESPN through the 2021 season. However, the financial offer from the Raiders was too much to turn down. Gruden is scheduled to broadcast Saturday’s playoff game between the Chiefs and Titans. That appears to be his final game with ESPN. In addition to giving Gruden a record-breaking contract, the Raiders are also planning to lock-up Gruden’s top assistants to long-term deals. According to reports, Gruden has already selected his three primary coordinators. Rams quarterbacks coach Greg Olson will become Oakland’s offensive coordinator. Former Bengals defensive coordinator Paul Guenther will have the same role with the Raiders. Finally, Rich Bisaccia will coordinate Oakland’s special teams. All three coordinators will be given four-year contracts, ensuring they will be with the team when the Raiders move to Las Vegas. Committing to Gruden and several assistants is a radical change for the Raiders after firing Jack Del Rio almost immediately after Sunday’s season finale. Del Rio actually signed a four-year extension with the Raiders last February after leading Oakland to a 12-4 record and playoff appearance in 2016. However, amidst rumblings that Gruden was looking to get into coaching, the Raiders fired Del Rio and put their focus into getting Gruden to return. Gruden previously coached the Raiders from 1998 to 2001. He was 38-26 during that time, leading the Raiders to two AFC West division titles and two playoff appearances. He was traded to the Tampa Bay Buccaneers prior to the 2002 season. Gruden proceeded to win a Super Bowl with the Bucs in his first season with Tampa Bay. Ironically, Gruden and the Buccaneers defeated the Raiders in Super Bowl XXXVII, giving Gruden his only Super Bowl ring as a coach. When Gruden returns to the sidelines next fall, he will do so after a nine-year absence. Late in the regular season, there were rumors that Gruden was calling assistant coaches as if he were putting a coaching staff together. There were rumors that he preferred to return to the Buccaneers. However, when the Bucs invited Dirk Koetter to return in 2018, that option was out. Meanwhile, there have long been reports that Raiders owner Mark Davis has stayed in touch with Gruden over the years and urged him to return to Oakland many times. It appears that Davis finally has his target. As of next Tuesday, Gruden will officially be the head coach of the Raiders once again.